Here are two smaller fashion dolls from the early 70's. On the left, Rosemary Rockflower, 1972, by Mattel. She is seated on her case.... I will have to re-photograph her, as lovely Rosemary is not showing up well! 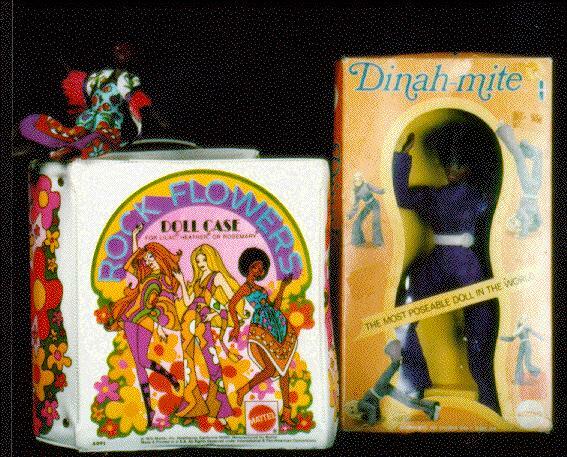 On right, Dinah-mite, 1970, by Mego. She was advertised as the most posable doll in the world. Definitely a Lil' Miss Dollikin competitor! This doll was also sold in a white, long blonde hair version. The Rock Flowers were a set of several different dolls. Each came with her own "groovy" record for you to play!